Ten questions to ask before implementing a gift & loyalty program. 2.Is it gift, prepaid and loyalty? 3.Do I have to buy cards from you? 5.Is the gift data encrypted? 8.Can you design the front and back? Why should you look at adding Mobile Gift through SelbySoft? In 2013 Starbucks processed 16% of its transactions through Mobile Gift! Read more about that here. With our Mobile Gift solution, you will make more money. Customers LOVE cool in the coffee industry and we are helping you bring that to them. Think about this . . . Customers can be reloading their gift cards when you are not even open! 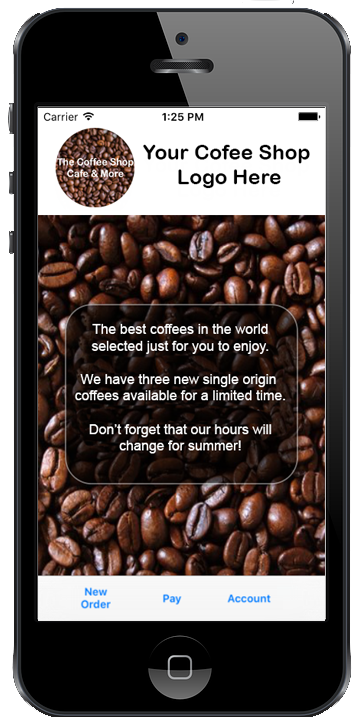 This is a custom branded Apple and Android app that will all you to compete with Starbucks in the mobile gift market. This app allows your customers to find YOUR STORE in the iTunes marketplace (Android coming soon)! Pay for their order from the phone (requires scanner). Check their gift card balances . Reload their gift card system (requires Vantiv Integrated Payments for security reasons). They even have the option to receive a discount when loading the card. All of this right from their smartphone! First, this is a CUSTOM BRANDED app for your store. SelbySoft will only be shown as the developer in the app store and not the actual app. This is why this is so different than the other apps out there. Give me a call and we can look at setting up YOUR Mobile Gift Solution. Why let Starbucks have all the fun?